A Gallipoli Friendship Concert will be given at the Cadogan Hall by the Royal Philharmonic Orchestra and Turkish and American soloists on Thursday April 5thin the presence of the Turkish Ambassador and representatives of Britain and the ANZAC countries, to commemorate those who fell in the 1915-16 Gallipoli Campaign, and the friendship that sprang up between them. The programme, presented by the Yunus Emre Institute under the auspices of the Turkish Presidency, will start with a unique scene-setting introduction given by bestselling author Louis de Bernières from his novel Birds Without Wings. The extracts reflect the harsh combat conditions at Gallipoli and the incredible acts of humanity between enemy soldiers. 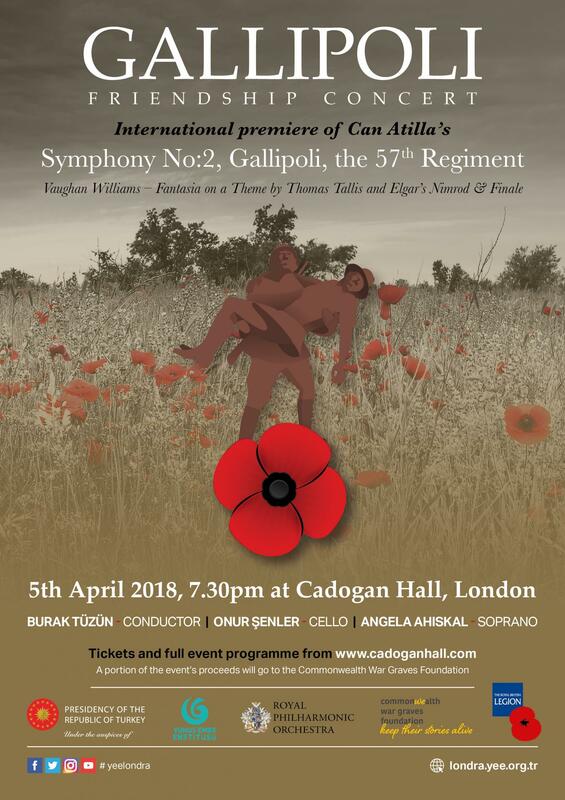 The musical focus of the concert is Turkish composer Can Atilla’s powerful 2015 requiem symphony Gallipoli – the 57th Regiment, written specially for the centenary of the Gallipoli Campaign, makes its international debut at Cadogan Hall. The composition cleverly uses Edwardian English tonalities to capture the pathos of the campaign, Atatürk’s role and his magnanimity in victory. Two lyrical soprano passages remind us of the immortal words attributed to Atatürk, committing the fallen “Johnnies and Mehmets” to Turkish soil; and a poem by the First World War Australian writer John le Gay Brereton. The Royal Philharmonic will be conducted by one of Turkey’s foremost musical interpreters BurakTüzün, Director of the Hacettepe University Symphony Orchestraand lecturer at the Ankara State Conservatoire.Two other leading artists, soprano Angela Ahıskal and cellist OnurŞenler, also feature prominently. Tickets are priced between £20 and £45, and are available from the Cadogan Hall Box Office. A portion of the event’s ticket sales will be donated to the Commonwealth War Graves Foundation, the charitable arm of the Commonwealth War Graves Commission, which maintains the graves of almost 50,000 troops on the Gallipoli peninsula in perpetuity.